As an eighteen-year-old taking his first airplane ride, I knew my trip to England would be unlike anything I’d experienced before. Back home, where I am able to fully appreciate my trip, I know for certain that I couldn’t have asked for a better experience. 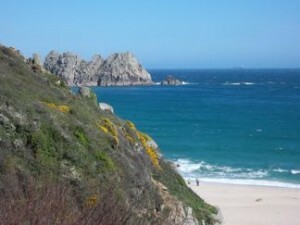 I recently had the pleasure of exploring Cornwall, in the southwest corner of England, with Dacey’s Cornish Tours. Cornwall, warmed by the waters of the Gulf Stream, looks nothing like the gray, rainy London many people imagine to be the whole of England. Instead, it is a land of palm trees and green pastures – and, at least in my experience, an unprecedented amount of blue sky. But the group of people I joined on this trip truly made it memorable for me. First and foremost, I’m convinced that the team behind Dacey’s Cornish Tours – David, Harry, and Tim – is the best in the business. I was lucky to have been joined by a stellar group of fellow travelers on my tour as well. Although they were all much older than I, every person in the group was friendly, even to someone younger like myself. By the first day, they had assuaged my fear of not being able to socialize well with an older group. By the tour’s end, I would go so far as to say I made some new friends. Cornwall is a distinct region of England, and each of the places we visited has its own unique flavor. Our first stop, Port Isaac (yes, of Doc Martin fame), had a definite seafaring vibe. 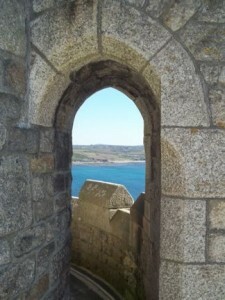 St. Michael’s Mount felt like a medieval castle to me. 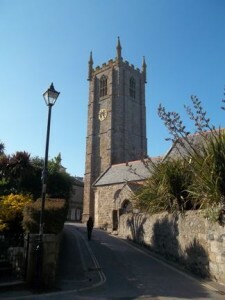 St. Ives appeared to be a major tourist town, but its buildings and beaches were too beautiful to ignore. Land’s End and the Minack Theatre represented the natural and man-made marvels of the region, while the city of Truro satisfied my need for “civilization.” I don’t think I would do them any justice if I tried describing the Lost Gardens of Heligan, the Eden Project, or Lanhydrock House; these places are better experienced than explained. Maybe it’s knowing when to tell the group some history and when to let the group members discover it for themselves. Maybe it’s the friendliness or the expertise. Maybe it’s just Cornwall. I still haven’t pinpointed exactly what made my trip with Dacey’s Cornish Tours so unforgettable, but one thing is certain: I wouldn’t want it to have happened any other way. Excellent summary of a fantastic trip. Congratulations on your graduation, Alex. It was a pleasure to meet you.